SAL DeTRAGLIA'S VIRTUAL TAPAS BAR: LET'S PLAY..."GUESS WHAT SAL IS DOING?" Here's a hint. It's something naughty. I don't know what you're doing, but I could probably use some of whatever you're pouring into those glasses. And I really like your table. p.s. The "la Fée Verte" (Absinth)comment was mine, too. Quite pricey compared with Spanish wine (I bought a bottle for what was about $0.42 in 2001 - just to see what a $0.42 bottle of wine tasted like - pretty bad, but heck the bottle, shipping & store over head must have been $0.40 - not bad wine for 2 cents - LOL) & Scotch - so maybe not considering your penny pinching ways. If it isn't absinthe - I don't see the "louche" (it doesn't look like it clouded up), how about a hint? I looked up prices & I guess Spanish Absinthe is less expensive than I thought - all Spanish varieties seem to be mixed & macerated. Ahh, THAT kind of naughty. That stuff will make you crazy, you know! I wonder how many jokes we could come up with using the word "maceration"? And Angie's right - very pretty table. Kudos to DeeJay Jazzy G, for guessing correctly. I was mixing-up to Absinthe cocktails. It was French Absinthe, and cost 12€ for the bottle. The reason you don't see the louche is because I was just starting to pour the water over the sugar cube. It clouded up nicely by the end. And damn! Those babies tasted much better than we expected. Indeed they will (or at least, are rumoured) to make you crazy. But I was doing it for a legitimate reason. Research. Primary research! The article will be published in The Spirit World (see sidebar) early next week. Reserve your tickets now. Christina and Ang, you are both invited to sit at my fiendisly-stylish kitchen table (yes, some men do have taste in decorating) and drink some Absinthe cocktails with me and my two cats. We all need a little primary research now and then. All I could do is drool over the Sangria pitcher on the table...ah, memories. Talk about the Absinthe making you crazy, I think that the whole time I was in Barcelona I was on a non-stop high from all the Sangria we drank. But I did have the chance to buy the one bottle of absinthe our local village wine and liquor had but the owner advised against it...wish I had gotten it now. That and the sangria pitcher...just can't find them here. Hmmm, so I should branch out and explore? What is this Absinthe stuff? TBF has a bottle of Absinthe that he bought in duty free in Madrid when we were coming home from visiting TBF's sister and family when she lived there (2001 -2003). He hasn't had any for a long time, but I need to alert him to the 5:1 ratio becuase I think he really messed up one of our neighbors serving it in a 1:1 ratio over ice. Mrs. TBF! This is like a visit from royalty. Welcome. 1:1?! No...wait. Did you really say 1:1? And about your neighbor...did he, by any chance, cut off his left ear before the night over? There were two bottles of Absinthe in my liquor store. The bottle I bought was 100 proof. It was the weaker of the two. The other bottle was 140 proof. I have a gut-feeling as to which TBF would've chosen. Did you try mixing absinthe with " the real thing"
Au revoir mon cher ami. Are you casting asperations upon my good character? Lol ... could be possible but really, no absinthe has touched my lips and clearly this was a wise move on my part based on alcoholic content. You sending a free bottle my way as motivation ... never would I be so shameless although, clearly you sense that I would immediately send jars of peanut butter by return post. Did I mention I've been eating peanut butter lately, on toast, sometimes with banana ... whatever I want really since it's freely available here. And off strolls the wandering woman, hands in her pockets, giggling a little ... hash well Sal. I just checked the liquor cabinet, and my absinthe IS the 140 proof version - who knew? I'm not really sure about the 1:1 ratio, though. If my memory is correct, I just put the absinthe in a snifter and added two ice cubes. So, it was probably about three shots worth of absinthe with about a teaspoon of water. I remember serving the drink, but I can't remember who I served it to. Come to think of it, it's starting to sound like I might have had one myself. It was Andy...and if I remember correctly, he brought the glass to his lips, sipped once or twice and then stumbled home. I think I ended up pouring the green fairy down the drain the morning after. Sal... you crack me up with the royalty comment. - Andy cut-off his left ear with an OXO Good-Grips potato peeler, and has been locked in his house painting sunflowers ever since. - TBF donned a black tie and jacket and sang the complete works of Mieskuoro Huutajat on the apartment balcony. - The hair-clog in that drain miraculously vanished. Absinthe! The beverage of choice for the hallucination generation. BTW...are you sportin' a 'stache??? TBF: The answer is "yes, but..."
By "but...", I mean that the 'stache was of the 24-hour variety. 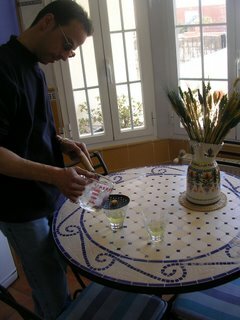 One of my Chicago friends who lives in Madrid came over for a guy's day out (thus, the Absinthe--5:1 ratio). Ribs were on the menu. I was on my back patio at 7am firing-up The Salivator, and was tending the fire uptil 5pm. So, by necessity, it was a day without shaving...as is certainly appropriate for a guy's day. Yes...the hair that I lack on my head seems to have migrated down to my face. Every now and then, a guy needs to channel the spirit of Brad Delp...even if it's only for 24 hours. Kim: I guess I was showing my age on the Nicky-baby post. "Bigfoot and Wildboy" aired about the same time as the Sonny & Cher Hour. Anyway...I sent an urgent message to Nicky-baby (c.c. 'g his father) stating, in no uncertain terms, that he must respond to Pickles. I'll give him a few days...then I'll respond myself. Those are the advantages of having Nicky-baby's login and password. In any event...thank Pickles for the message, please.